I am running a periodic series where I interview some of the professions collectors come across. My purpose is to shed light on what they do and how they work, especially for new collectors. For the third post in this series I interviewed Dorothy Raphaely, owner of Antique Map Coloring by Dorothy Raphaely. Dorothy Raphaely has been in the business of coloring antique maps for twenty some years. Her training is as an artist, and by career a graphic and textile designer. Like many of us in the the world of antiquarian maps, she is motivated by passion, saying that collecting maps “pulled her in”. Dorothy immediately identifies herself as a “reluctant colorist” believing that not all maps should be colored. 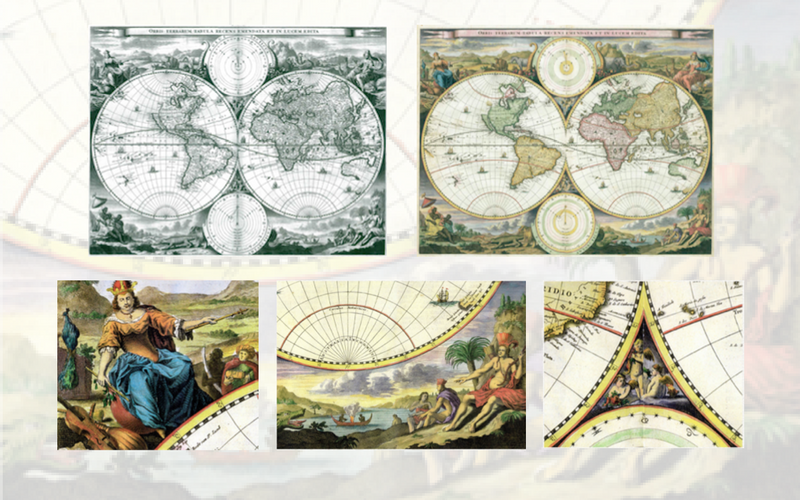 This is certainly in keeping with conventional thinking within collecting circles that a well colored map is often of higher value than an uncolored one, such is not always the case; further, poor coloring, not in true to the norms of the period, will devalue a map. Her clients are typically dealers, and as such, determining whether and how a piece should be colored is collaborative, however Dorothy says she will push back when she believes a piece should remain uncolored. Decorative maps are her favorite to color as they afford the most opportunity to showcase her skill.